Effective treatment for oily skin conditions is available for the control of excess oil. In most cases acne prone skin types can be managed and treated at home. There are numerous acne treatments and techniques that can be used for common oily skin problems for teens or adults. Having a nice glow is one thing but an excess oily complexion is frequently accompanied by pimples, facial redness, and can lead to bad bacteria infections and acne. An over-abundance of face oil, due to overactive sebaceous oil glands, will usually tend to cause your complexion to look shiny, thick, coarse, and dull and it is generally further aggravated with contributing factors such as diet, certain cosmetics, excessive exposure to heat and humidity, pregnancy and birth control pills. Due to your genetic makeup and hormonal changes you will just have to learn certain things that can lessen the oiliness. On a brighter note, you will be less prone to wrinkle compared to other skin types. Face washing with a mild cleanser can help reduce surface oils, unclog pores and remove old surface cells. Avoid harsh products that contain irritating ingredients that over-dry and strip needed natural oils which will signal and encourage your sebaceous glands to react by creating more oil. Be careful to take care and not over do it. Avoid too much scrubbing. Tone –A facial toner helps to balance your skin, clean pores of any last traces of makeup and dead cell buildup.After toning the face, apply a natural non-comedogenic oil free moisturizer to keep the skin supple and a protective sunscreen product to prevent element damage. Makeup- Choose cosmetics specifically designed for oily type complexions. Do not use oil-based cosmetics, which will only aggravate, clog pores, and create conditions suitable for further problems to form. Use water-based, non-comedogenic beauty products. Taking care to avoid those facial cosmetics that can irritate and possibly cause infections, and always removing your makeup before going to bed will help give your rejuvenation products a chance to work through the night. 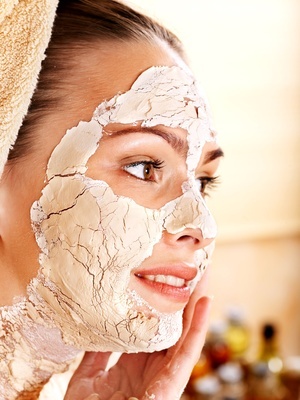 To help control oil and shine, use facial clay masks one or two times a week. Mask treatments are helpful to remove, absorb, and dry up excess oils. Blend together 1 Tablespoon green clay powder and 1 Tablespoon raw honey. Apply the paste mixture to your face, neck, and décolleté, avoiding the eye area. Leave it on for 15-20 minutes, rinse well with lukewarm water and pat your face dry. This recipe is also wonderful for acne, spot, and body treatments. Taking care of your body and what you eat will translate to your skin. Eat foods rich in proteins that have plenty of anti aging vitamins and include good quality nutritional supplements. Drink plenty of water daily to keep the skin hydrated and to help cleanse and flush out toxins in the body. Green tea is also a great antioxidant-rich source to eliminate toxins naturally from the body. Foods that tend to aggravate the condition should be kept track of and avoided. Reduce the amount of saturated and trans fats in your diet. Avoid pork, fried, processed foods, and highly seasoned foods. Limit alcoholic beverages, soda, and caffeine. Eliminate sugars, and junk food. Do not smoke.This harmful habit risks the overall health of the skin and can accelerate the ageing process. Getting sufficient beauty sleep is essential for skin’ cellular repair. A good nites sleep is a time for our skin to repair and rejuvenate. Exercise increases circulation and encourages blood flow to help nourish and cleanse your skin from within and improve the appearance of your complexion. Learn to relax and manage stress. Skin issues can be triggered by stress. Stress can cause the sebaceous glands to pump out more sebum.